"The main issue is that there is only a handful of islands in the Southern Ocean and not all of them are suitable to sustain large breeding colonies" says Robin Cristofari, first author of the study, from the Institut Pluridisciplinaire Hubert Curien (IPHC/CNRS/University of Strasbourg) and the Centre Scientifique de Monaco (CSM). 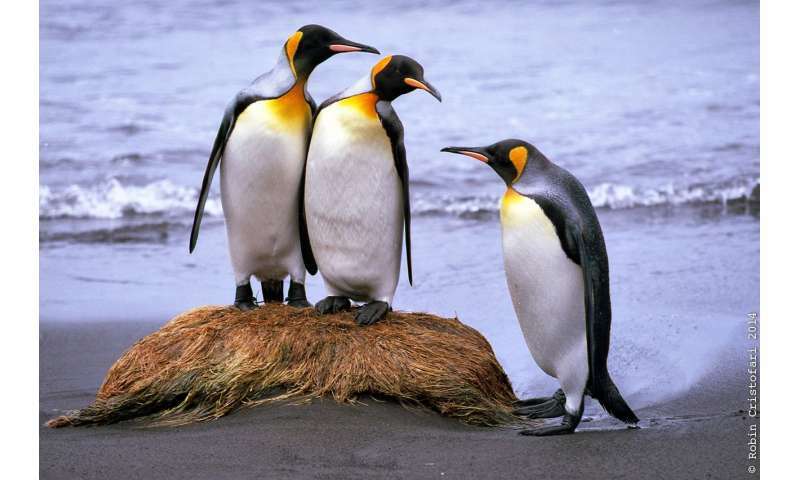 King penguins are in fact picky animals: in order to form a colony where they can mate, lay eggs and rear chicks over a year, they need tolerable temperature all year round, no winter sea ice around the island, and smooth beach of sand or pebbles. But, above all, they need an abundant and reliable source of food close by to feed their chicks. For millennia, this seabird has relied on the Antarctic Polar Front, an upwelling front in the Southern Ocean concentrating enormous amounts of fish on a relatively small area. 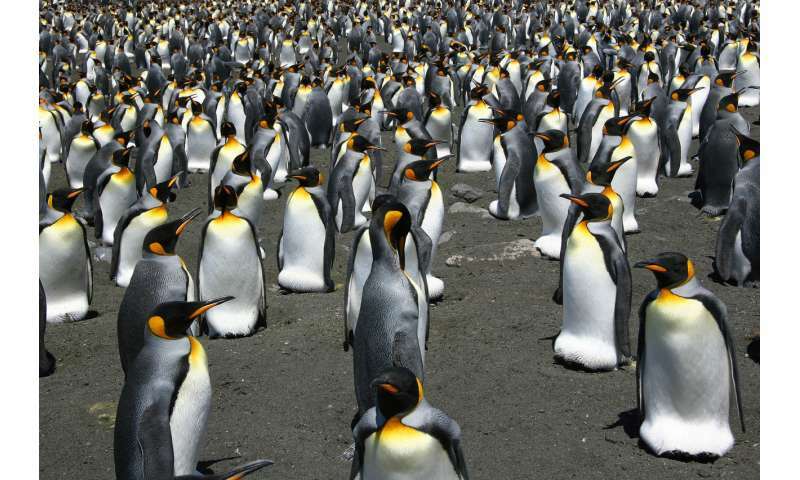 Yet, due to climate change, this area is drifting south, away from the islands where most King penguins currently live. Parents are then forced to swim farther to find food, while their progeny is waiting, fasting longer and longer on the shore. 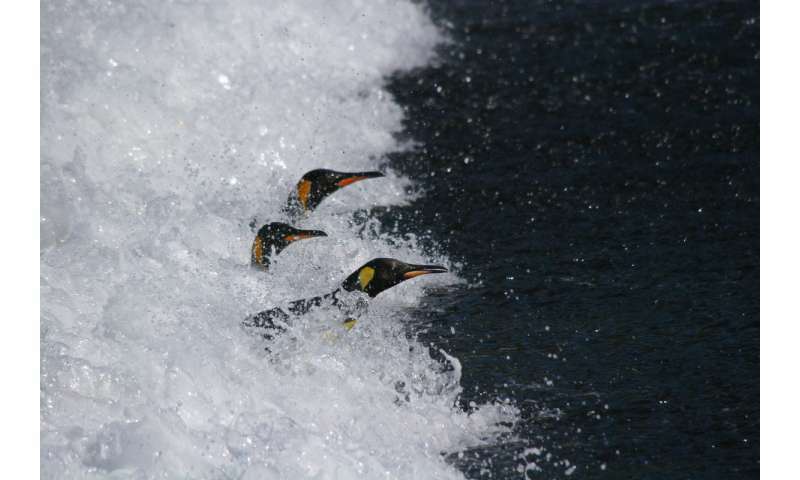 This study predicts that, for most colonies, the length of the parents' trips to get food will soon exceed the resistance to starvation of their offspring, leading to massive King penguin crashes in population size, or, hopefully, relocation. Using the information hidden away in the penguin's genome, the research team has reconstructed the changes in the worldwide King penguin population throughout the last 50,000 years, and discovered that past climatic changes, causing shifts in marine currents, sea-ice distribution and Antarctic Polar Front location, have always been linked to critical episodes for the King penguins. However, hope is not lost yet: King penguins have already survived such crises several times (the last time was 20 thousand years ago), and they may be particularly good at it. "Extremely low values in indices of genetic differentiation told us that all colonies are connected by a continuous exchange of individuals", says Emiliano Trucchi formerly at the University of Vienna and now at the University of Ferrara, one of the coordinator of the study. "In other words, King penguins seem to be able to move around quite a lot to find the safest breeding locations when things turn grim". But there is a major difference this time: for the first time in the history of penguins, human activities are leading to rapid and/or irreversible changes in the Earth system, and remote areas are no exception. In addition to the strongest impact of climate change in Polar Regions, Southern Ocean is now subject to industrial fishing, and penguins may soon have a very hard time fighting for their food. "There are still some islands further south where King penguins may retreat", notes Céline Le Bohec (IPHC/CNRS/University of Strasbourg and CSM), leader of the programme 137 of the French Polar Institut Paul-Emile Victor within which the study was initiated, "but the competition for breeding sites and for food will be harsh, especially with the other penguin species like the Chinstrap, Gentoo or Adélie penguins, even without the fisheries. It is difficult to predict the outcome, but there will surely be losses on the way. If we want to save anything, proactive and efficient conservation efforts but, above all, coordinated global action against global warming should start now."